Fell runners have been banned from using GPS to help them navigate in competitive races in Wales. A proposal put forward in the summer has been adopted for all Welsh Fell Runners Association (WFRA) registered races as of Tuesday. The organisation said GPS "threatens the fundamentals of our sport". Runners can record their route on a GPS watch, but cannot follow a pre-set route, use a device showing a map or pre-load checkpoints on their device. Altimeters are still allowed and people can use devices which show how far they have run. The move comes after a vote held by members at the AGM of the WFRA, which the organisation said was a response to feedback from members. Secretary Andrew Blackmore said: "The use of GPS devices for navigational purposes is not commensurate with the ethos of our sport. "Fell running is a simple sport - you have some hills and some checkpoints to visit. You use your skill and fitness to get between these points as fast as possible." Race organisers will flag certain directions or specific instructions for runners - as they do at present. Runners can use GPS to navigate themselves to safety in an emergency, but must declare themselves a "non-competitive participant" at the finish. Punishments for those caught using a GPS device will be at the discretion of race organisers, but Mr Blackmore said the aim was to educate rather than punish competitors. 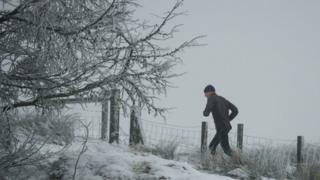 Helen Brown, a member of Mynydd Du fell running club and safety officer at the WFRA, said: "It's supposed to be a simple sport, accessible to everyone and not everyone can afford a GPS device - they're very expensive. "It's much more about being true to the sport and its origins." Paul Dodd, 61, a member of Chepstow Harriers Running Club and a race organiser, would like to see the sport move with the times to help attract more people. "Fell running seems to be the reserve of traditionalists - to them, a big part of fell running is the dark art of navigating with a compass and a map," he said. "It's a shame there's this barrier to more people getting into the sport because we insist on them using this ancient dark art."